Monogram it for no additional cost! 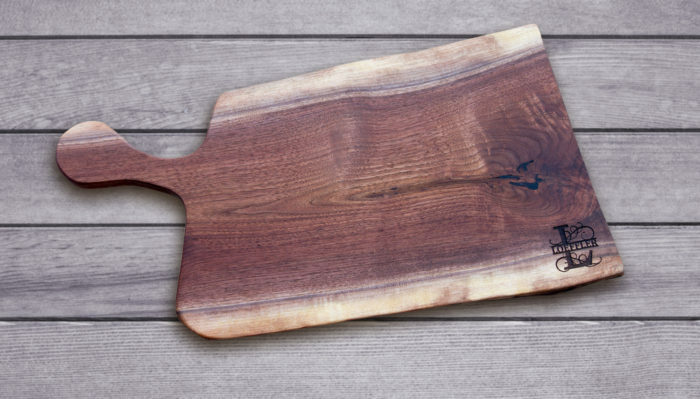 Although designed for charcuterie (shahr-cute-uh-ree), our boards add a sophisticated element to any gathering no matter the spread; fruits, cheeses, pâtés, nuts or any other appetizer, for a festive presentation. Each one-of-a-kind board is hand crafted from North American Walnut and made in Tarpon Springs, FL. Finished with a food-grade oil. Please do not put your board in the dishwasher. Hand wash only. XXL size ranges from 27″-32″ (L) x 8″-12″ (W), including handle. Choose a blank board, one monogram (bottom right corner), or two monograms (bottom right and bottom left corners). Monograms are all CAP letters. We are proud to offer, at no additional cost, a double monogram option for those couples who do not share the same last name. 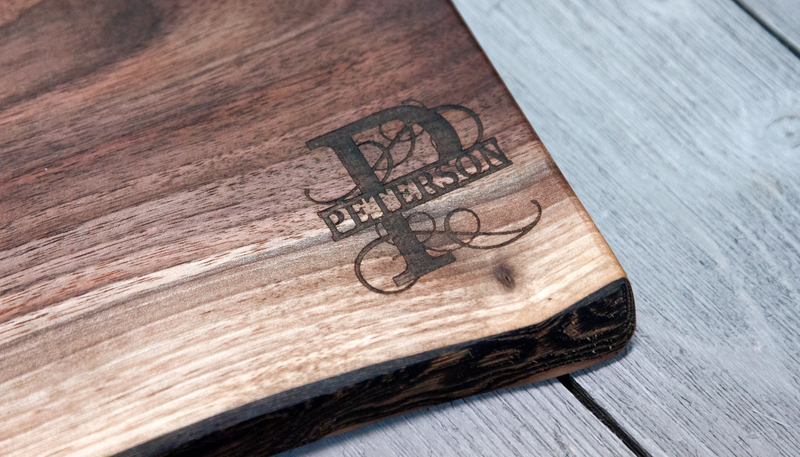 A very solid, stylish, functional board that is so beautiful & personalized with our family name that we just love it. The large size works so well & makes a great display for cozy gatherings. I get tons of compliments when I host. Loving it & can’t wait to give some for gifts this year. This is a beautiful charcuterie board. Our name is monogramed on the board which makes it so elegant! 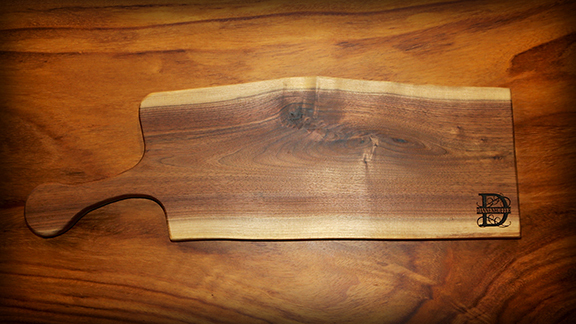 I love to color of the solid walnut and this board provides ample space to present numerous appetizers for quests. I would definitely recommend this product to anyone looking for a one of a kind, high quality , personalized gift. 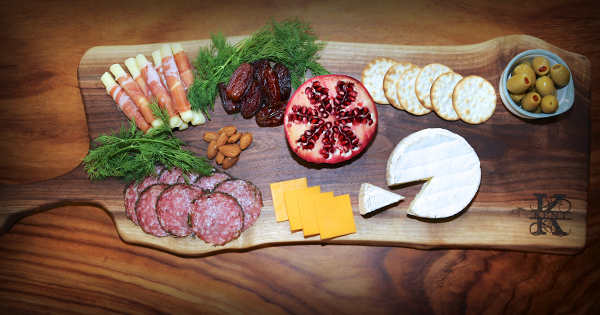 Wow – We are thrilled with our Charcuterie Boards. Like ours so much have ordered some Christmas gifts for my son and Dad. They are going to love them too. The personalization awesome. We have ours set out all of the time, rather than just for company. It’s not only functional, its beautiful. Nice job Brad and Brad. We will be back to order our new dining room table after the holiday. Unbelievable wood, quality and size. These are perfect for that friend, employee or family that is hard to buy for. The pictures don’t it justice, the personalization makes it a show piece for any family to display proudly! The perfect Christmas gift just arrived at our home! Our new charcuterie board is beautiful. It will most certainly be inaugurated during the upcoming holiday cocktail parties!